Coach Mike Bartrum, center, talks to his team during a game during the 2018 season. 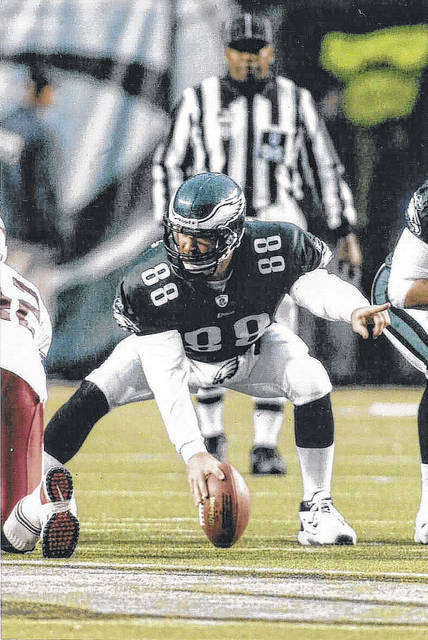 Mike Bartrum was a tight end and long snapper for the Philadelphia Eagles and other teams during his 13-year NFL career. Commissioner Mike Bartrum speaks during a National Day of Prayer event at the Meigs County Courthouse. 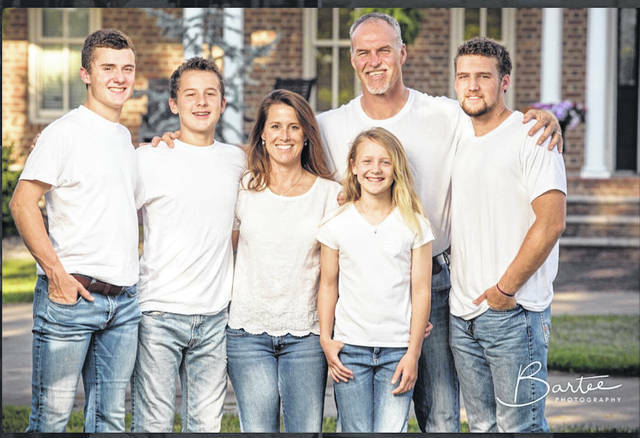 The Bartrum Family: Mike, Jennifer, Cody, Zach, Ty, and Taylor. POMEROY — Mike Bartrum has left his mark on Meigs County, it’s people and in particular the football players he has coached during his time back home in Meigs County. Now, Bartrum is returning to the NFL — this time as a coach. The Meigs High School and Marshall University graduate played for the Chiefs, Green Bay Packers, New England Patriots and Philadelphia Eagles during his 13-year career in the National Football League. Bartrum played both tight end and long snapper during his career. After signing a contract earlier this week, Bartrum will be returning to the Eagles as the assistant tight ends coach. The move back to the NFL has been about four years in the making, noted Bartrum, with things moving forward quickly in the past few weeks. Bartrum, who played under now Kansas City Chiefs Coach Andy Reid, said that Coach Reid has been an important influence to many of his former players, helping them along the way after the playing days. Several of those players, or former Reid assistant coaches, have went on to coaching roles in the league. Bartrum is now among those ranks. A few weeks ago Bartrum interviewed for the position of assistant special teams coach with the Cleveland Browns. Soon after, he received a call from Coach Doug Pederson, head coach of the Eagles, to interview for a position with the team. Bartrum interviewed for the Philadelphia job around a week-and-a-half ago and was in the office for the first time last Monday. “It was a God thing,” said Bartrum of the way things have worked out. “I have been so fortunate,” said Bartrum of the opportunity. This is not only an opportunity for Bartrum and his family, but friends and those in Meigs County to once again have the connection to the NFL. He also noted that without the support of his wife, Jennifer, who was his high school sweetheart, that it would not be possible for him to take this step. While Bartrum is beginning his role new, Jennifer and their two youngest children, Ty and Taylor, will be joining him in Philadelphia at the end of the current school year. The Bartrums also have sons Cody, who is currently in college in Charlotte, and Zach, who is a senior at MHS and will be playing college football in the fall at Ohio Dominican. While it is always sad to move on, and particularly to leave “home,” Bartrum said he would not want to look back and have the “what if” of having not taken this step. Going back to Philadelphia, Bartrum said he was welcomed with open arms. From Coach Pederson to Executive Vice President of Football Operations Howie Roseman to the Laurie Family, Bartrum said everyone has been “so hospitable and a class act.” Meeting Quarterback Carson Wentz, center Jason Kelcie and the other coaches, Bartrum said it feels like he has known them his whole life. Bartrum stated that when he left Philadelphia in 2007 it was under good terms as he retired from playing due to an injury. In the 12 years since, there have been changes to the facilities which have grown and upgraded, as well as advancements to the computer system, said Bartrum. He has already hit the ground running, having been given tasks and projects that he will be working on in the coming days and weeks. Philadelphia also provides a family atmosphere with football, said Bartrum, adding that coach Pederson often has his three sons on the sidelines. The father of four, Bartrum said he is looking forward to those opportunities, particularly for Ty and Taylor, who were not old enough to remember the experience from when he was playing in the league. Bartrum has held many roles in Meigs County since returning to the area upon his retirement from professional football following the 2006 season. He has been a Meigs County Commissioner since January 2009, as well as the Meigs High School Football Coach since the 2012 season. 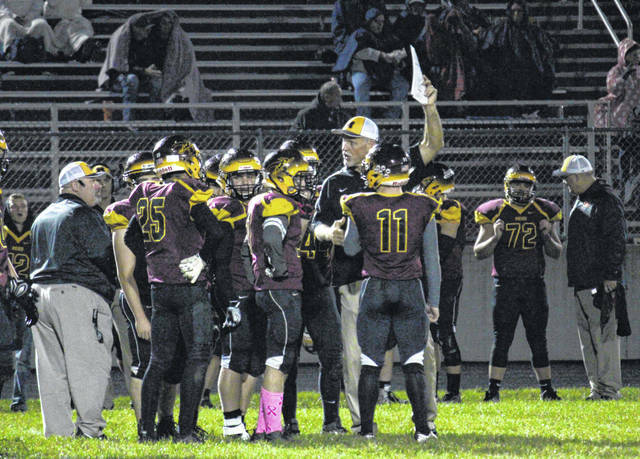 During his seven seasons, the Marauders compiled a 33-37 overall mark, including a 7-3 record in the 2013 season. The team played a tough schedule each year, facing teams like Ironton and Steubenville. “In order to be the best you have to beat the best,” said Bartrum of playing a difficult schedule each year. Bartrum’s tenure saw multiple players go on to continue their football careers in college. The coach said he regrets not being able to meet with the team before word got out to others, but that the weather cancelling school has made that difficult. He plans to meet with the team early this week. While it is bittersweet to leave Meigs, Bartrum said he is making sure everything is in place for the next coach, whomever it may be, and will be 100 percent supportive of that person. He added that Coach Mike Chancey had done the same for him when he began coaching and he wants to do the same for the next person. Bartrum expressed his appreciation for all of those who have played a role in the Meigs football program over his time there, including those who have helped with feed the team nights, Masons who helped with the Jamboree Game, the assistant coaches, school administration and teachers, custodians, bus drivers, the parents, grandparents and players. 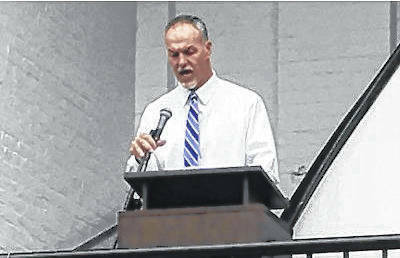 He noted a special appreciation for former Superintendent Rusty Bookman, former Principal Steve Ohlinger and the Meigs Board of Education for giving him the opportunity back in 2012 to become the football coach. Bartrum’s mark can also be seen at his alma mater due in part to his work with the Meigs Local Enrichment Foundation (MLEF). Working along with Frank and Amy Blake, Steve Musser and many others, the MLEF was able to raise more than two million dollars for the athletic fields at Meigs Local, which includes the football complex that opened in 2012. The MLEF was founded in 2007 to enrich the quality of Meigs Local School District and the surrounding community. Bartrum noted that it was not the work of one person, but the work of many coming together to make the dream become a reality. “I have cherished every moment since we moved back here (Meigs County) in 2001,” said Bartrum. On a personal note, Bartrum said it is sad to move away from his family, particularly his parents, but that with the advancements in technology they will be able to still see the kids games and other activities even when they cannot be there in person. Bartrum has been taking time to go around to see the different office holders, county employees and others, meeting with as many as he can personally as he prepares to leave his role as commissioner. “I love this county, and while I am moving away, I am still here, I am just a phone call away,” concluded Bartrum.